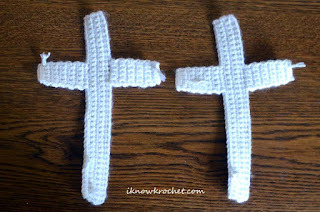 When my kids were baptized, I gave them personalized crosses to hang on the wall above their beds. They are wooden and quite beautiful, but a bit costly. 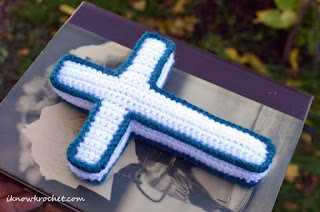 I recently realized I could use my newfound crochet skills to make a three-dimensional plush crochet cross to hang on the wall that would be quite adorable for a baby or young child's room. So I set out to design a simple cross that is flat on the front and back and can be easily hung on a wall. 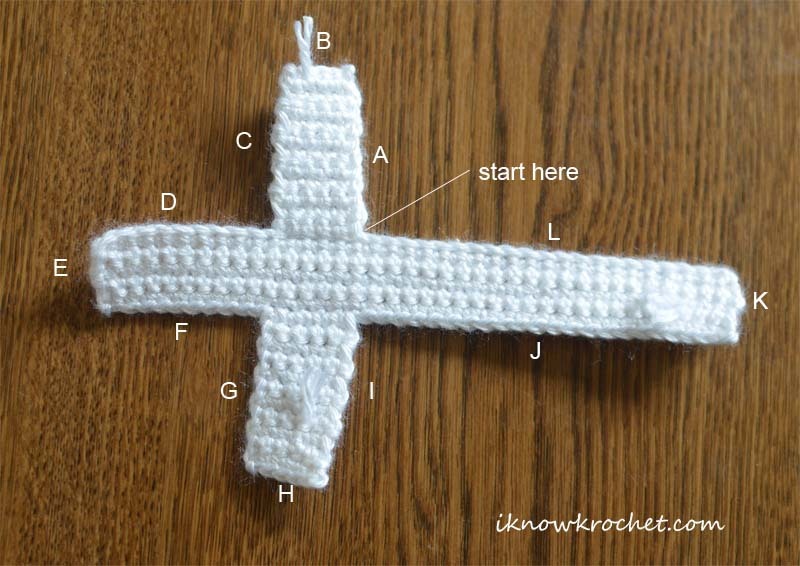 This is a very simple pattern, but even something this easy can pose challenges. 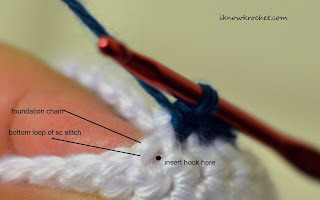 My first tip is to make sure the two faces (front and back) are identical, including leaving the loose ends sticking out just a little from the same side after weaving them in (I recommend this to ensure the ends don't slide out and end up on the wrong side). When you assemble the front and back pieces, place them as mirror images so that the foundation chain of one is opposite of the foundation chain of the other. This just keeps everything more balanced and the loose ends will end up on the inside for both pieces. My other tips are noted above, but just to reiterate, make sure the side that you want the pretty border to face (e.g., the front piece) is facing up and closest to you when working the border; otherwise, the top loops of the border will face towards the center strip and not be as pretty. Stitch markers are extremely helpful to make sure the corners are in the right spots and also make sure you don't have too much or too little of the center strip left over when you reach the end. I ran out of stitch markers, so I just used pieces of red yarn (see photo above). I originally marked one side, then recounted and marked the second side of the strip when I was ready to add the second contrasting color border. To be honest, the stitch markers that I used are so cheaply made that several broke in a row. This was very annoying, but for $1, maybe it's still worth it. When they don't break, they are very nice to have for a project like this. 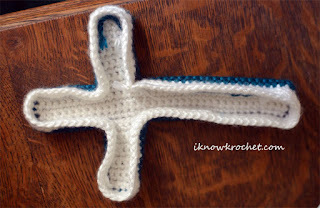 A final note: when I used a contrasting border for the edging, the white poked through slightly at the corners. This was mostly a problem at the spots where there was a knot (i.e., beginning or end of a piece). 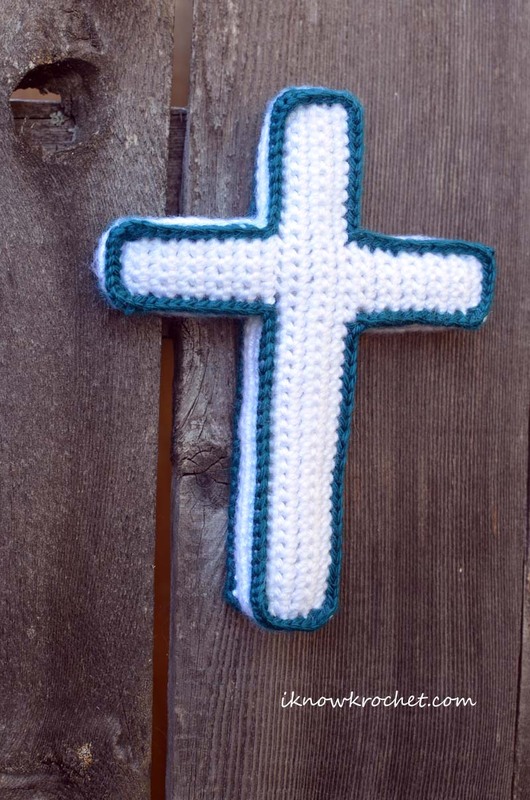 To completely avoid this issue, consider making the entire cross using only one color. 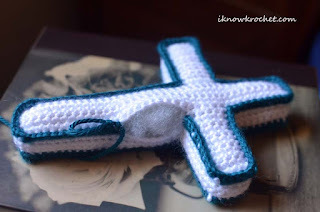 So there you have it, an adorable plush crochet cross to hang on the wall of a child's room! I have more plans for adorning this cross, so stay tuned for a follow-up blog post. Until then, what adornments would you add?